WASHINGTON -- Nearly every tourist who comes to Washington, D.C., remembers the moment they first laid eyes on the White House. And many of them also remember looking directly across the street and spotting the little white tent surrounded by anti-nuclear signs. But on Thursday morning, that tent was gone. Concepcion “Connie” Picciotto, 77, had maintained her peace vigil since Aug. 1, 1981, making it the longest-running political protest in the United States. Her tent was modest, described by the Washington Post in a recent profile as "an old patio umbrella draped in a white plastic sheet secured with binder clips." Picciotto occasionally steps away, but she's always replaced by one of her fellow activists who live with her in a Peace House, so the camp is always attended. But the person who was supposed to be watching the tent last night walked away, and the Park Police dismantled it in the early morning hours on Thursday. Watch The Huffington Post's interview with Picciotto above. Peace House manager Feriha Ka told the Washington Post that the individual on shift was a combat veteran suffering from post-traumatic stress disorder. 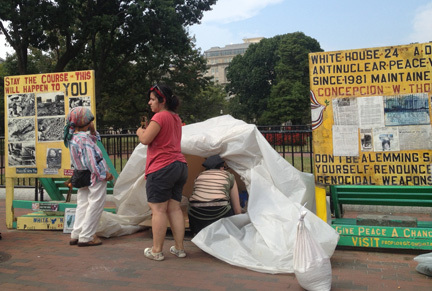 "This is the time, more than ever, we need people to mobilize, to stop killing and the wars all over the world," Picciotto told The Huffington Post, while waiting on Pennsylvania Avenue for the Park Police to bring back her tent. On Thursday afternoon, the camp was back up. "It's frustrating, because it's hard to be there," she said, adding that she has endured harassment, including of the physical kind, over the years because of her vigil. But she stays put. "I am in the heat, in the cold and the snow," she said.